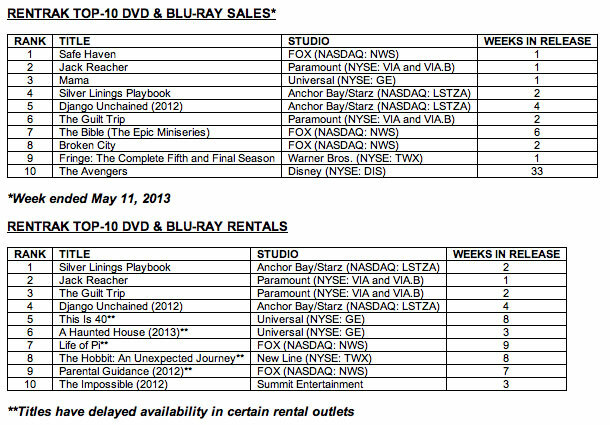 Want to know what the most popular Blu-ray and DVD releases were for the week ending May 11, 2013? At the top of sales in Blu-ray and DVD was FOX s mystery/romance Safe Haven starring Julianne Hough and David Lyons. Coming in second was Paramount s action film Jack Reacher with Tom Cruise. And, coming in third place was Universal s horror film Mama. See more titles in the Top 10 list below. In terms of rentals, for the week ending May 12, 2013 Silver Linings Playbook from Anchor Bay/Starz was ranked as number one. Jack Reacher came in second. And, Paramount s The Guilt Trip followed in third. See the rest of the Top 10 in the grid below. Looking at market longevity, Buena Vista s The Avengers sits in the Top 10 Blu-ray and DVD sales even after 33 weeks since release. In rentals, FOX s Life of Pi ranks in the Top 10 after 9 weeks since release. And, This Is 40 (Universal) along with The Hobbit: An Unexpected Journey (Warner Bros.) also rank in the Top 10 after 8 weeks.